A Twist In Discussions Of Chimpanzee Spirituality : 13.7: Cosmos And Culture Are they — or aren't they — spiritual beings? The question is back in the news, as the author of a study discusses findings and possibilities with anthropologist Barbara J. King. 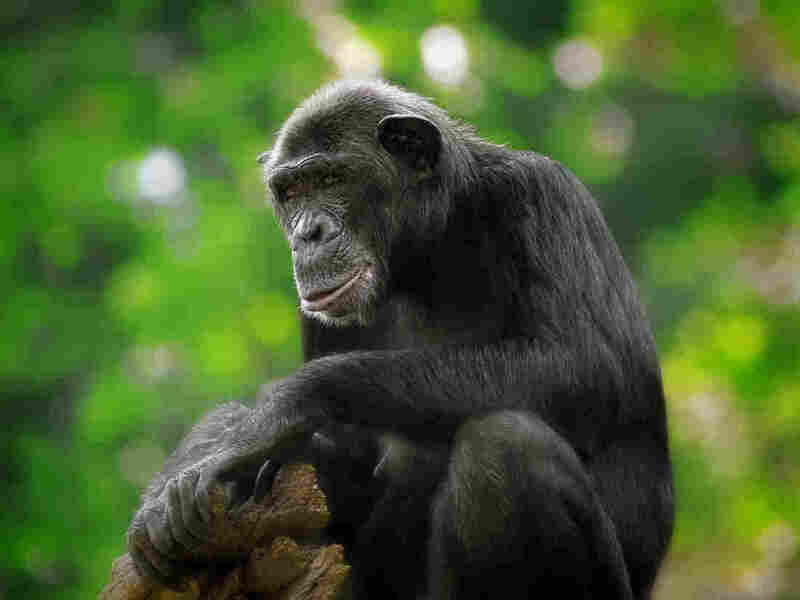 "Maybe we found the first evidence of chimpanzees creating a kind of shrine that could indicate sacred trees. Indigenous West African people have stone collections at 'sacred' trees and such man-made stone collections are commonly observed across the world and look eerily similar to what we have discovered here." My response to this passage was skepticism, both at The Atlantic and here at 13.7, because the leap from "potential chimpanzee stone-throwing ritual" to "sacred trees" is just too great for me. Fast forward to last month, when Wisconsin Public Radio's Steve Paulson aired an interview with Kehoe at To the Best of Our Knowledge. Kehoe described the basics for Paulson's audience: how chimpanzees in Guinea, often but not exclusively adult males, throw large (8 kg. to 9 kg.) stones at selected trees repeatedly, and sometimes place the stones in a tree cavity instead of hurling them. Could this be a ritual with a spiritual dimension? Could the trees be shrines? "Plausibility shouldn't be mistaken for proof," Kehoe replied to Paulson. "I do think that it's a possibility — some things can seem unlikely until they are discovered." In the same segment, Paulson also interviewed me and primatologist Frans de Waal. We each suggested simpler explanations like apes wishing to impress an audience of other apes, or pure pleasure in aimed throwing at trees. But then an interesting thing happened. Kehoe reached out to me by email to express her regret about how her views on stone-throwing have been presented in the media, including in Paulson's interview, which, she felt, focused disproportionately on the spirituality angle at the expense of other possible explanations that she offered. When I communicated this — with Kehoe's permission — to Paulson, he pointed out that he had "left in [the interview] her comments about this being a highly speculative possibility — something worth considering — and her dislike of the newspaper headline about chimps finding God." But here's the main point, and a surprising one: Kehoe told me that she doesn't, in fact, really think that the spirituality explanation is the most likely one at all. "Our field guide, Mamadou Alioh Bah, first spotted the marks on a hollow tree. Lucy D'Auvergne (an experienced primatologist) and I decided to set-up a motion-activated camera and caught the elusive behavior on tape a few weeks later." "This is the first time we have found chimpanzees repeatedly using stones at specific sites — with no relation to finding food. I think it most likely came about as part of a male display and could be related to long-distance communication — as there aren't many roots with large buttresses for drumming in this area and the sound of a stone hitting a hollow tree may carry better in a savannah ecosystem. It is also possible that the stone accumulations may serve as some kind of territorial landmarks. However, both of these theories are tricky to test given that many of these sites are outside of protected areas and undergoing local habitat loss." "Of course, it is partly my fault for alluding to the possibility that this mysterious behavior could be linked to something sacred — this is because these sites are superficially very similar to human stone accumulations at 'sacred' trees. While I do think this aspect is worth pondering, it is a highly speculative remark that is by far one of the least likely explanations to this behavior. It has no concrete evidence." With Goodall's enduring view, of course. With the remark of James Harrod, also interviewed by Paulson, that chimpanzees "of course" have an experience of religion (not just spirituality) because they experience reverence, awe, and wonder in the ways Goodall described. "Religion is something we feel in and express with our whole bodies, Schaefer insists, and once we realize this, we are free to see religion in other animals in certain instances of their embodied and emotional practices." "While science can tell us a great deal about the evolutionary benefits of religion — and even certain brain functions that happen during spiritual experiences — it has little to tell us about the nature of the experience itself. Consciousness remains a huge mystery, and spiritual experience is part of that mystery. So if spiritual experience among humans is largely beyond the capacity of science to explain, why do we assume that chimpanzee spirituality is strictly a science question? None of [the points raised in discussion] proves that chimpanzees have spiritual experiences or a sense of the sacred. But given all that we've learned about chimpanzees over the last 50 years — and how they keep surprising us — why should we assume that they don't also have transcendent experiences? That would seem to be a tantalizing possibility that's worth considering." Can chimpanzee spirituality be productively explored outside the realm of science? As I told Paulson on the air, an insistence on delving into chimpanzees and the sacred, in my view, says a lot more about us than it does about chimpanzees.